Anthropology won a large and appreciative audience in the West in the first half of the twentieth century by combining adventure stories like those of the great Victorian explorers with a new sensitivity to the rich human lessons that could be learned from the ‘natives’. Figures such as Franz Boas, Bronislaw Malinowski and Margaret Mead ventured into remote corners of the world still unfamiliar to Westerners: the Arctic, far-flung Pacific islands, and the interior of New Guinea. They brought back not human captives or golden treasure but the fruits of the new techniques of ‘participant-observation’: reports on the stories people told themselves in myths and religious observance; how they coped with the challenges of adolescence, relations between men and women, gift giving and commercial exchange; and how they struck a balance between the demands of the individual and the needs of the community. Such reports proved compelling: especially after the First World War, when ‘Western civilisation’ was inclined to doubt itself, the ‘natives’ provided fresh resources for thinking about how best, and how variously, to be human. 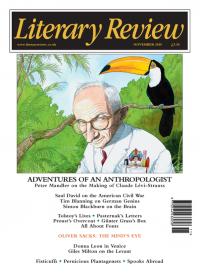 The anthropologist Claude Lévi-Strauss, though born after these pioneering anthropologists and before the First World War, made his impact in the second half of the twentieth century and had something quite different to offer: theory. How to explain the appeal of this new and rather forbidding commodity, and to build it into a biography, is Patrick Wilcken’s challenge.